The DFG31 is being phased out. Product will be available until stock is depleted. Please see the DFG55 SERIES as a possible substitute or contact our Pressure department. 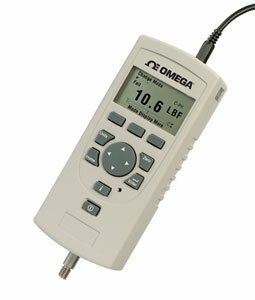 OMEGAs DFG31 Series is an easyto- use digital force gage designed for economical applications without compromising functionality. It’s available in 7 ranges from 2 to 500 lb force and features a measurement accuracy of better than 0.25% full scale. A large, easy-to-read, high resolution dot matrix LCD supports a variety of standard gage functions including normal and peak readings, high/low limits, setpoints, pass/fail results, statistical results, load cell actuation and direction. Loads are displayed in ozf, gf, lbf, kgf and Newtons. The display can be inverted and displayed results may be "hidden" from the operator. RS232, and ±2 Vdc analog outputs are standard.